A study led by the British Antarctic Survey, in collaboration with the University of Cambridge and the Scottish Universities Environment Research Centre, found that when migrating across the Southern Ocean, older albatrosses use less effort to catch their prey than younger individuals. Greater foraging effort was costly only for old birds, which had lower breeding success the following season. "Albatrosses can live for over 50 years, yet the ability of parents to successfully raise a chick decreases from their teenage years onwards – the reasons for this were not clear. "We focused on the migration period, when birds spend a year at sea far from the breeding colony at South Georgia. They do this to recover from the previous breeding season, and prepare for their next breeding attempt. We found a clear pattern with age – older birds landed on the ocean surface less often than younger birds. 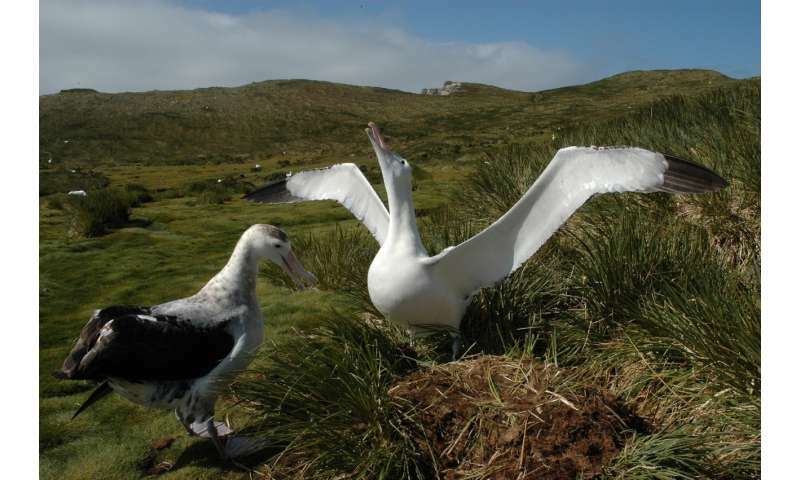 As landing and taking off again require a lot of energy for an albatross, this suggests that older birds in general are more efficient at catching fish or squid. "We expected that a reduced number of feeding attempts would be a direct sign of deterioration in physical fitness with age. Yet surprisingly, we found that lower effort in old birds leads to higher breeding success, indicating that efficient old birds tend to do better." Researchers attached tiny tracking devices, geolocators, to rings on the legs of over 80 adult wandering albatrosses ranging from 8 – 33 years old. The loggers measure light, from which location can be estimated, and also the frequency at which a bird lands on the ocean surface, which indicates an attempt to catch fish or squid. The authors also found out what the birds were eating from the chemical signatures on their feathers. "Although, there are differences in activity patterns, we found no indication that this reflect a change diet with age, and so conclude that old birds have similar dietary tastes to young birds but they have probably improved at searching for or capturing prey." The study was funded by the Natural Environment Research Council (NERC). The paper, published in the journal Functional Ecology, is titled: "Age-related variation in non-breeding foraging behaviours and carry-over effects on fitness in an extremely long-lived bird."